A pilot project in Honduras thwarts the recent epidemic of coffee leaf rust while also empowering women and supporting low-emission agriculture. Women farmers get access to small plots of land to plant with disease-resistant coffee and tree crops. The land and seedlings are paired with fuel-efficient cookstoves, ensuring that the women gain both long- and short-term benefits. The pilot’s straightforward approach, centered around women’s needs and agency, will be scaled up across Honduras and into Nicaragua and Guatemala. CCAFS. 2015. 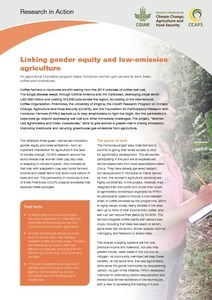 Linking gender equity and low-emission agriculture. Research in Action. Copenhagen, Denmark: CGIAR Research Program on Climate Change, Agriculture and Food Security (CCAFS).